Ever since it was announced that The Incredibles was finally getting a sequel, we’ve been eagerly awaiting our first look at the new film. It’s been a long 14 years since we saw the heroic Parr family in action and our hearts have been aching from the withdrawal symptoms. Thankfully Pixar and Disney have heard our cries and so the superhero clan will be back in action on the big screen later this year in Incredibles 2 which looks just as brilliant as the first. Details of the film have been pretty hush-hush until now but we have known for a while that the sequel will pick up exactly where the first movie left us. That was a long time ago so let us refresh your memories. The Parrs were settling back to life when new villain Underminer arrived in town – with perhaps the best baddie name ever created – and so the family donned their masks once again. It starts right as the first one finishes, so it just carries on. It starts with the Underminer and a big old set piece. You know that at the end of the first movie when he comes up and you see the family dressed as superheroes, well that’s where we start this movie. 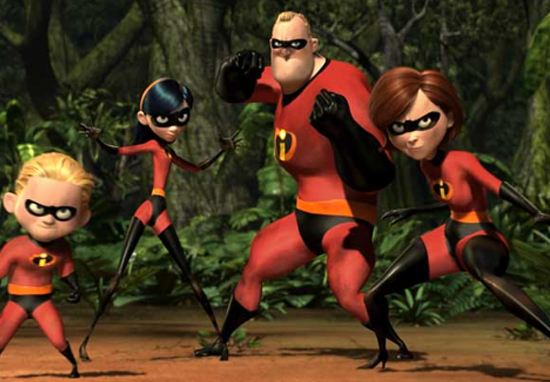 One of the unique things about The Incredibles is it’s really a story of a family set in the world of superheroes. This one carries on that theme. It’s awesome, the idea we came up with — simple as that. We love to really look at our own lives and look at what’s going on, and find themes that we know will resonate with the audience. Since the announcement of the sequel, Pixar have been teasing us with glimpses of what we can expect the Parrs to get up to in Incredibles 2. In November a fun teaser was released with the youngest Parr, Jack-Jack, using his laser eye powers to cut out the shape of the logo. That was only the start of the teasing though as Pixar have gradually been releasing some funky posters that are only getting us more excited for the film to be released. Another features the face of the one and only Edna Mode, the Parr’s fashion designer, who is in charge of making their outfits look fabulous – of course with no capes. Edna is voiced by writer and director Brad Bird who is back on board for the second film. Honestly, we can’t wait for this to come out! Lucky US audience will be able to see the film from June 15 while those in the UK will have to wait until July 13.